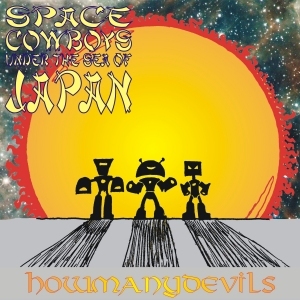 This entry was posted in Space Cowboys Under The Sea Of Japan and tagged Album, art rock, electronic, funk, HMD, HowManyDevils, Music, SCUTSOJ, Sheffield, Space Cowboys Under The Sea Of Japan, synthpop, The Oyster. Bookmark the permalink. I don’t think I have a snowballs chance in hell of getting every guitar I own on to the same album, let alone every instrument. it’d take some serious planning! Now, how did The Oyster come about? I’d come up with the guitar part during the week but I was a little worried about presenting it to the band because it was fairly rock and we were trying to be different (I say it’s rock, the verse riff is kind of synthpop but on a guitar, but the chorus is pure grunge). I played it anyway and the other two both liked it. Simon went to dig through the lyrics he had while I showed Pete the basic chords and he came up with the bassline. We were in a catch everything and work on it later mood so after a couple of rehearsals/working outs we put a take down in Logic to a click track. My guitar part from that is the one on the final version. Pete started experimenting with the verse bassline in the last verse, and what he came up with really worked for a break in the song, so we re-recorded him with that change fully worked out and edited my guitar around it to make space. Simon’s vocals are the second take, but only because we had no monitoring and lots of live instrument leakage on the first take. After that we just fitted the drums to the song structure (aren’t sequencers great) and added some subtle synth parts.